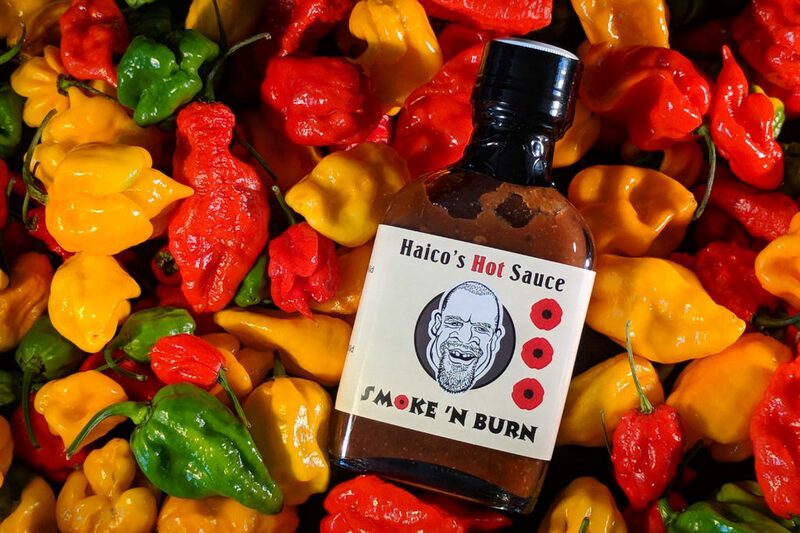 Haico's Hot Sauce – The Spiciest Peppers in the World Grown in our Backyard! Taking Over the World with Hot Sauce! 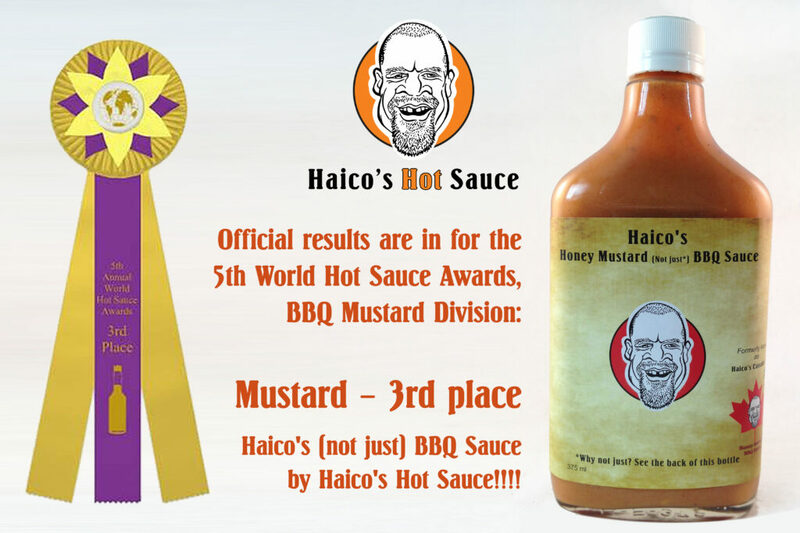 Official results are in… Haico’s Hot Sauce Wins 3rd Place for ‘Best BBQ Sauce’ in BBQ Mustard Division! Amazing! Our Haico’s (not just) BBQ Sauce by Haico’s Hot Sauce won 3rd place in the BBQ Mustard Division presented by the 5th Annual World Hot Sauce Awards, hosted by the Louisiana Culinary Institute – featuring Celebrity Master of Ceremonies Jay Ducote (Creator of Jay D’s products). This was a WORLD WIDE competition with competitors from 12 countries (Australia, Canada, Switzerland, Costa Rica, Czech Republic, Germany, Great Britain, Hungary, Sweden, Slovenia, Slovakia and the United States). Results were calculated based upon 577 entries that were received from 158 companies. Smoke ‘N Burn is here to stay due to popular demand! Our newest creation: Smoke N’ Burn. A mix of Smoked Jalapeños, Smokie Ridge “Soldiers Pride” red wine and with a flavour that will leave you yearning for more! 15% of the proceeds of this product will be donated to Military Families. Price: $15. mild and delicious sauce , the only pfoblem was that it is too good. I had company over on the weekend and I put the sauce on the table with our meal and now it is almost gone. Thanks Haico for making a great sauce. I am so happy to hear that you and your visitors have been enjoying the Red Dawn! Check out our Marketplaces page to find out where you can get more! Keep it spicy! Bought your Scorpions Kiss at Chili Chilis. It is tasty and ya Hot…. It won’t last long. I eat that sh%#!×t on everything….. Just found my favourite sauce. Will be trying more of your product. Great stuff. Hi Blaine! Thanks for the raving review! So glad you are enjoying it! Keep it spicy! Haico is a great guy who makes even greater sauces! I am completely in love with Devil’s Brew, an extraordinarily hot and delicious blend of the 3 hottest peppers with a flavor profile that will keep me coming back for more. An instant favorite. Cannot wait to try more of his creations! Brilliant. Thanks Greg! So glad you are enjoying the products! Keep it spicy! Had the pleasure of meeting Haico (and the whole hot sauce family!) at a craft show this past weekend. So thrilled I did! Loved all we tasted and have been enjoying everything we brought home! The flavours are distinct and give each sauce their own personality. Really enjoying the Smoke N’ Burn! Thank you! Thank you for the raving review! Enjoy! Just had some beautiful homemade venison stew with Scorpions Kiss and wow did it kick with a bold flavor backing up the inferno . Got some respect for its straight jab . Thanks for the review. People are trying out your recommendation to use it with venison. Had people come by this weekend just for that reason!